Buffalo's Common Council is starting to look at some kind of ban on those Styrofoam "clamshell" containers that fast food restaurants and other food outlets use to keep food warm as it is taken away. 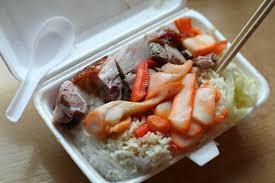 The Council is specifically looking at a ban on what is called "Expanded Polystyrene." New York City is looking at that ban because EPS can't be recycled and poses a threat to many kinds of wildlife. It can fill the stomachs of birds or whales so they can't eat. "I didn't want to simply write a law without hearing from people how it will affect business, how it will affect our environment, how it will affect our county, even," said Council President Darius Pridgen, "and so our ears are open to hear." Pridgen said there is no actual proposal, but he has invited the public and the Sierra Club Niagara Group to come to the Community Development Committee meeting Tuesday afternoon. Pridgen said a Buffalo ban would focus on the clamshells. "What we're looking at if we were to go, is about takeout containers," Pridgen said. "That's right," Council member David Francyzk agreed. "A person would still be able to go to Tops or make a choice on whether they wanted it in their home," Pridgen said. "We talked about the clamshells at the fast food restaurants, at the takeout," Francyzk said. Franczyk tried for a clamshell ban. He and then-Councilmember David Rutecki passed it many years ago and then tried unsuccessfully to get it passed in the Erie County Legislature. He said supermarkets blocked that plan. "Heavily lobbied against it and the leadership of the Legislation - I'm not going to say who was the leadership at that time - kind of kiboshed it. They put a kibosh. So we were never able," said Francyzk. "We had public demonstrations in front of the Legislature. We spoke in front of the Legislature. But at that time, they did not want to have a local law for the County of Erie. So we thought it would have been punitive just to have it for the City of Buffalo." Cities and countries are banning or charging fees for single-use plastic items like bags and straws. This week, the wealthy beach community of Malibu, California, voted to ban restaurants from giving out plastic straws, utensils and stirrers. Overseas, Scotland wants to ban plastic straws by 2019; Taiwan is banning single-use plastics by 2030. So is it possible to entirely get rid of these "throwaway" plastic items? Eric Goldstein, senior attorney and New York City environment director at the Natural Resources Defense Council, joined Marketplace Weekend to discuss.